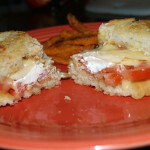 I have not posted a grilled cheese sandwich recipe/entry since August 29, 2010. That adds up to over two months of non-grilled cheese photographing and writing. Amazing, isn’t it? I had no idea it had been that long. 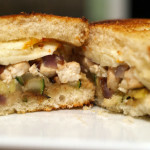 Either way, I am back with a brand new grilled cheese that has Thanksgiving/fall undertones. Last year, I went with pumpkin pie dip. This year, I went with delicata squash. And it turned out pretty well. Almabtrieb, or descent, [is] a day celebrated with a festival that draws locals and tourists alike. Farmers drape their cows with flowers, with the lead cow from each farm given a more elaborate bouquet. Spectators line the route to watch the cows traipse down, a reminder of the economic importance of cheesemaking in these mountainous regions. Hirtenkäse, literally “herdsman’s cheese,” is an aged cow’s milk cheese that has been made in the Allgäu for centuries from the pooled milk of small farms. The version we are seeing locally is produced at a dairy that collects its milk daily from 250 farms, with an average of only 12 cows each. The milk is pasteurized before the cheesemakers proceed with the culturing, curd cooking, molding and pressing required for an age-worthy cheese. I can only assume that the variety sold in San Francisco, would be very similar to the one found here in Cleveland, Ohio. If I am wrong, feel free to correct me. In texture and flavor, the 14-pound cheese resembles a cross between Parmigiano-Reggiano and aged Gouda, with a firm golden interior and aromas of butterscotch and orange peel. The wheels sent here are at least 8 months old, but Bay Area Whole Foods stores are selling Premium Reserve Hirtenkäse, matured for at least a year and identified by a black label. Even at eight months, the cheese has developed some of the crunchy protein crystals found in Parmigiano-Reggiano. But additional aging makes the cheese creamier, not harder and dryer. It has a waxy texture – it even smells waxy – but it isn’t crumbly like Parmigiano-Reggiano or firm enough to grate. The flavor is concentrated, with the cooked-milk sweetness of a caramel. I want a nutty, slightly sweet wine with it, such as an oloroso sherry or a Madeira. The most intriguing part here is that the cheese becomes creamier when aged, which goes against the common thought/practice that most aged cheeses are dryer. 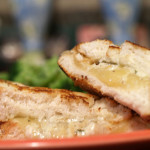 Even if you don’t try this sandwich, I would definitely try this unique cheese. 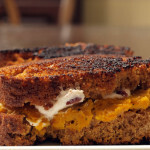 It is fall and almost Thanksgiving so I thought why not use a fall vegetable for this grilled cheese? Whole Foods had a intriguing display for the delicata squash so I decided to use it instead of the more traditional butternut squash. 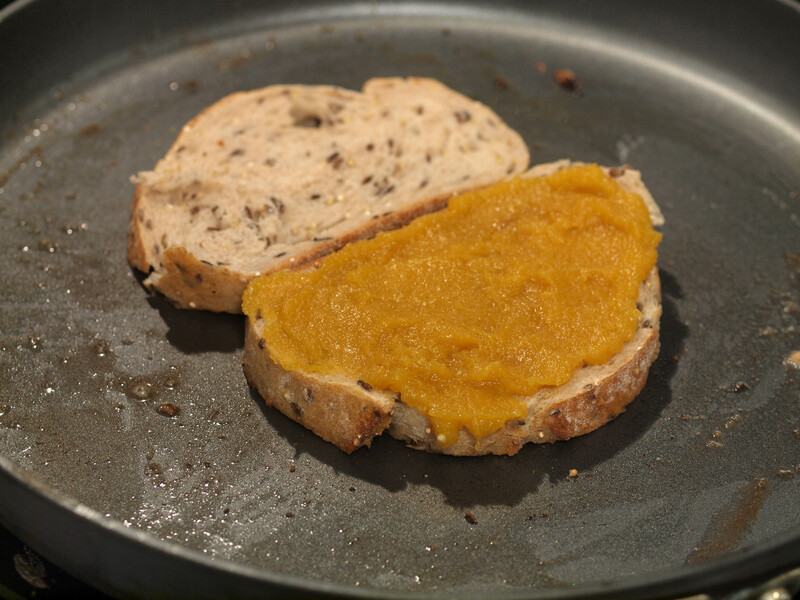 After the sous chef scooped out the insides of the squash, we added brown sugar and sweet butter to enhance the flavor. The sweetness was definitely apparent when eating the final grilled cheese. I like to try new breads as much as I like to try new cheeses so I was excited to find that Whole Foods had a great selection of breads available. 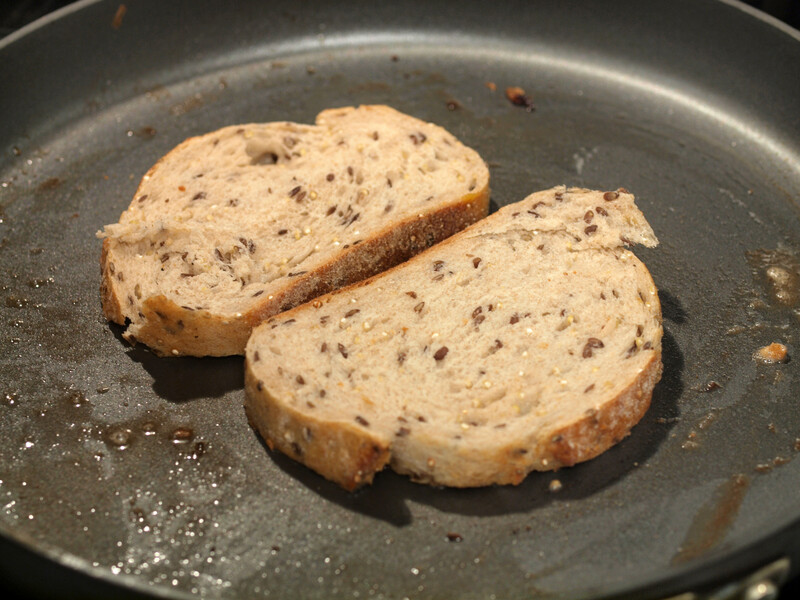 I took a liking to the flax/quinoa bread and after trying it, I decided to purchase it. 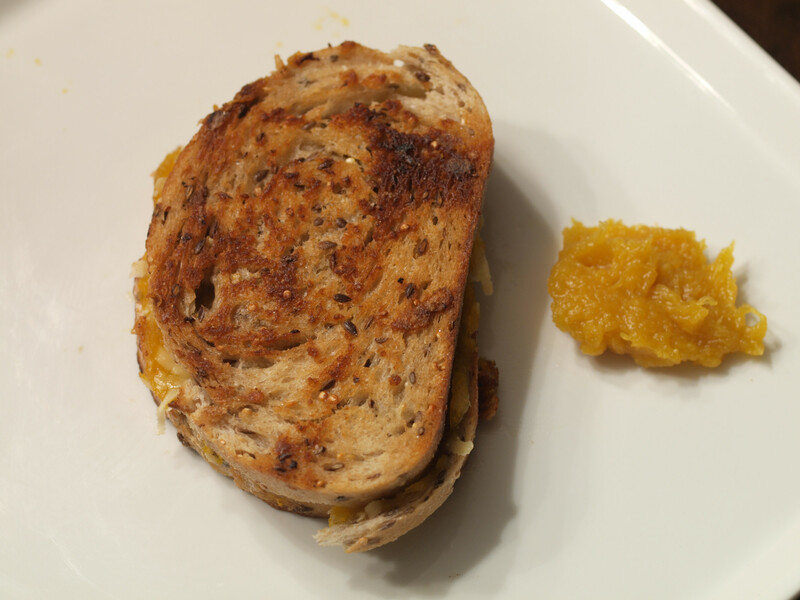 The sous chef had been (and still is) under the weather for the past few days (make sure to tell her to get well) so tonight’s grilled cheese was in doubt. However, I was lucky enough to squeeze it in without working her too hard. I went simple and it actually turned out pretty well. 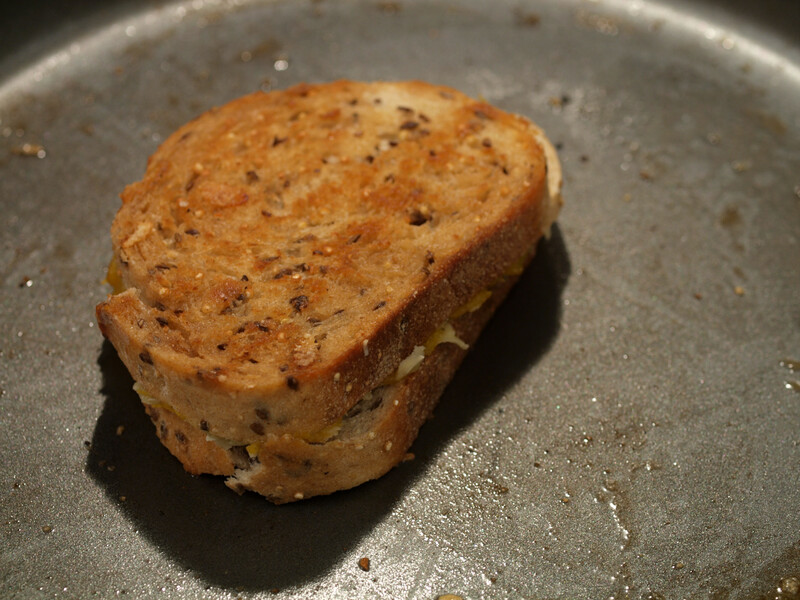 The grilled cheese was good, with a sweet interior and a crunchy outside. 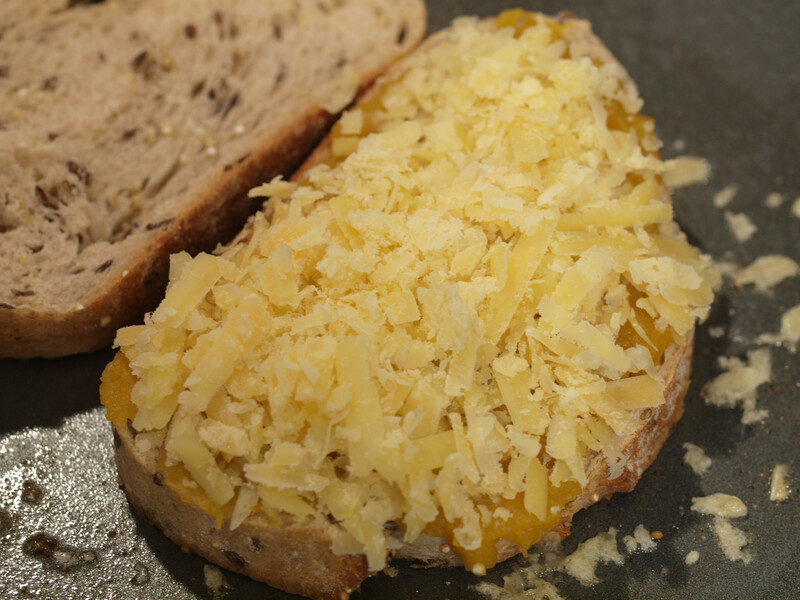 The cheese and delicata squash melded very well together and felt right for the season. 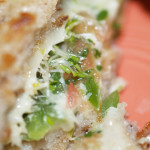 However, I don’t see this grilled cheese sandwich being extremely memorable, hence the minus in the “A-” grade. 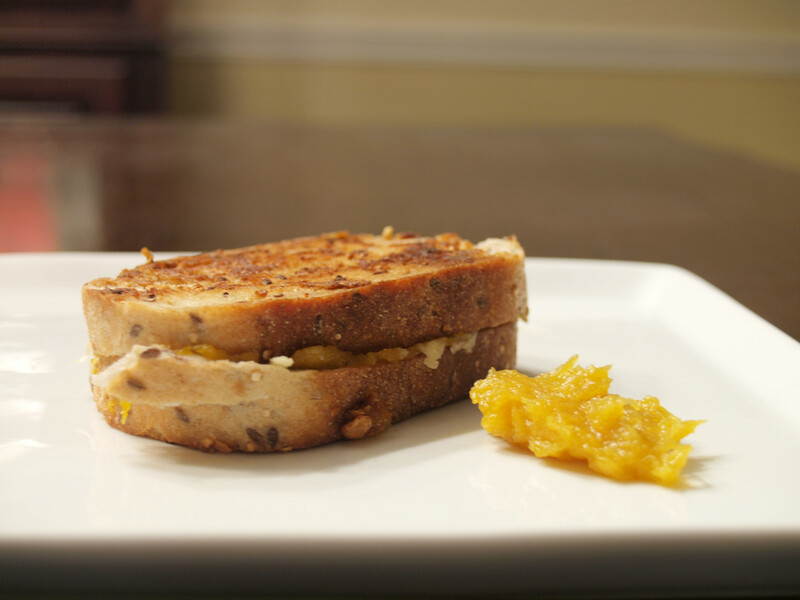 Posted in Grilled Cheese and tagged A Minus, delicata squash, flax quinoa bread, grilled, hirtenkäse, squash.